TIAMSA New York Private Tour, November 1 at 6 p.m.
TIAMSA New York Event: Wednesday November 1 at 6 p.m.
Visit to the Grey Art Gallery exhibition, Partners in Design: Alfred H. Barr Jr. and Philip Johnson. Members are welcome to join us for the first TIAMSA New York sub-committee event this fall. We will meet at the Renee & Chaim Gross Foundation (526 LaGuardia Place) at 6 p.m. for a private guided tour. First established in 1974 with donations from friends and supporters of American artist Chaim Gross (1904-91), including Joseph H. Hirshhorn and Roy R. Neuberger, the Renee & Chaim Gross Foundation was incorporated as a 501(c)(3) not-for-profit organization in 1988. The Foundation is located in the couple’s historic Greenwich Village townhouse and the artist’s studio space. Afterward, we have the option of visiting the nearby Grey Art Gallery at NYU (100 Washington Square East). The current show, Partners in Design: Alfred H. Barr Jr. and Philip Johnson, explores how Alfred Barr, MoMA’s first director, and Philip Johnson, the curator of architecture, introduced modern design to North America. TIAMSA members, prospective members, and their guests are welcome. Please RSVP here. If the studio and the workshop are the places where artworks and new ways of thinking and seeing most often take shape, exhibitions are the sites where such creations meet the public and, in the course of their reception, make, and re-make, art history. 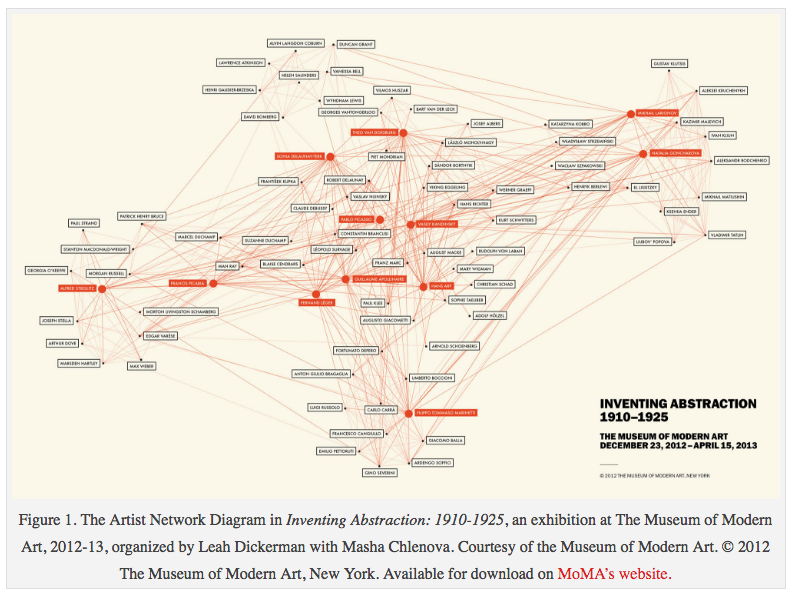 Inventing Abstraction at the Museum of Modern Art (December 23, 2012-April 15, 2013), which critics praised as offering a fresh, inclusive and cross-disciplinary perspective on the origins of artistic abstraction, is one such exhibition summoning the full potential of this form of object-based historiography.1 Alongside modernist titans like Picasso and Mondrian, the exhibition spotlighted comparatively unfamiliar figures and many women artists. Curator Leah Dickerman further stressed the transmedial reach of abstraction beyond the traditional domains of painting and sculpture by foregrounding abstract photography, music, dance and poetry, paralleling MoMA’s own disciplinary re-orientation beyond painting and sculpture over the preceding decade……..
Dr. Dorothea Schöne, Berlin, on „German Art has Come to Its Own Again.“ Prices for German art in the United States 1945-1960: actors, institutions and strategies. In the autumn of 1957 the exhibition “German Art of the XXth Century” opened at the Museum of Modern Art in New York. It was the first comprehensive presentation of Modern German Art in Anglo-Saxon countries after the end of World War II. Generously funded by the Foreign Office of the Federal Republic of Germany this show aimed to be an act of reparation and rehabilitation of so-called “degenerate” art and to present Germany as a renewed cultural nation after 1945.